I believe that this series was made by the same group that put out "Victorian Farm", and later "Edwardian Farm", correct? I have watched "Victorian Farm" in its entirety (based on your recommendation I believe) and it was excellent. Anyone who enjoys this blog will appreciate these programs. 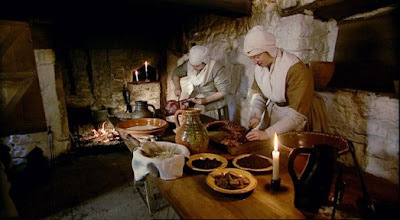 Unlike even the PBS versions of reality TV (like "Frontier House"), the programs focus strictly on how people of these eras lived - there is no drama amongst the show cast and the focus remains on the lifestyle and skills employed the people of these eras. Yes, same production company and the same characters too. I hope to post a page of links here for both Victorian Farm and Edwardian Farm too. I think that having all the links in one place makes it easier to navigate through the episodes. They are all so very well done and a delight to watch. Thanks Herrick. Just watched the first episode and can't wait to share it with the kids. Always on the lookout for something like this. I think the series is great for kids, though it's not a bad idea for a parent to screen every episode. Some parents may find a few odd comments objectionable. Like, for example, when they are making a wattle and daub wall on the barn. The daub is a mixture of clay, straw and animal dung. They spread it on with their hands and, though they refer to the dung as dung in the beginning, in the end they remark a couple times that they have sh*t on their hands. That's a word we don't use in our family conversation, but some people have no problem with it. I will admit, though, that I once heard my grandmother say the word when I was a little boy... and I'm still shocked. "The Deliberate Agrarian" has been included in this weeks Sites To See. I hope this helps to attract many new visitors here. Thank you for posting this! I've seen Ruth in the Victorian Pharmacy series but This one really strikes how I feel life should be lived; toil and reward, life for life's sake and not only to pay the bills. A gift for you. The entire series will automatically play from the video here. It's 6 hrs. all total. Frames appear when a particular show ends which you can select and save link. Or, if you prefer to put all the 15 min. links in order just rt. click, select video url and they'll all appear on youtube, right side of page. There is also a link to 'Edwardian Farm' which I'm looking forward to. Thanks so much for your wonderful website. Thanks for posting this! Watching these has made a rainy day very enjoyable! It truly is fascinating and a great learning experience. I just wanted to thank you for posting this... I'd never heard of this program before and my husband and I thoroughly enjoyed watching them over the last few weeks. (So much so that I'm preparing to post them and bring them to my readers attention as well.) I'm looking forward to seeing the other series now as well!